DJ and I just got back from our 20 week visit and as with most things there is never a dull moment. Petry is clocking in at 11 inches and 11 ounces (the size of a very large banana) and mommy is weighing in at 130 pounds - up 10 lbs from her original weight. Today we learned I had Placenta Previa, "an obstetric complication in which the placenta is attached to the uterine wall close to or covering the cervix". (see picture below). It can sometimes occur in the later part of the first trimester, but usually during the second or third. It affects approximately 0.5% of all labors and is common in women who 1) have several children, 2) are over 35, 3) have had uterine surgery, 4) had prior c-sections, 5) are carrying multiples, 6) smoke, or 7) conceived through IVF (ding!). The annoying thing is all these categories of women (smokers discounted) have gone though enough crap already to get pregnant. Now life decides, "hey, I didn't think you were stressed enough - here is some praevia to go with that". The doctor doesn't seem overly concerned and said there is a 99% chance this isn't anything at all, but as with everything it is better to be safe than sorry. We go back July 23rd for our 24 week visit and another chance to see Petry in utero. There are three types of placenta praevia. 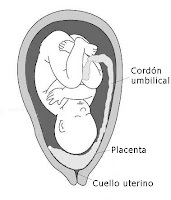 Marginal Previa: the placenta extends just to the edge of the cervix. Previa often corrects itself by the end of the pregnancy . The placenta itself doesn't actually move but as the uterus stretches it is not as close to the cerivx as it was earlier in the pregnancy. Of course like everything from morning sickness to leg cramps, the cause is unknown but "can be blamed on several factors". Did someone have to go to medical school to tell you that? Thanks doc. All of these words: complication, hemorrhage, bleeding - make the issue sound a lot worse than it is, but it is something that should be taken seriously. The doctor today said there is a very good chance the placenta will move, opening the baby's exit through the cervix or, if it doesn’t, I can just have a C-Section and all will be good. This occurs in 1 in 250 births so when you think about it, it’s not that uncommon. 117 to 1 chance of being on a place with a drunken pilot. We are also at the halfway point of the pregnancy and at this stage Petry can hear sounds and recognize my voice, and can react to loud sounds from inside the womb. There is also some movement in there which I can feel from the inside out, but DJ has yet to feel anything from the outside in. Taste, hearing, smell, sight, and touch are also beginning to develop so I hope Petry likes oatmeal, bananas, peanut butter, and 80's music.